March 25th officially marked the introduction of one of the most anticipated collections from Integrity Toys in a long time; The Monarchs Homme. Brainchild of Integrity Toys designer Vaughn Sawyers, it is the reincarnation of the beloved FR: Homme line, the one collectors have been waiting for six years now. Their revamped storyline revolves around a super exclusive social club called "The Monarch", supposedly a gathering place for business, ideas, networking and more that has been around for more than three generations. The members who are part of this institution call themselves "THE MONARCHS" and that is how the line got it’s name. Exclusive male clubs are such an outdated idea in 2019 that it made me cringe just reading about it. Let’s be done with patriarchy even in our fantasy doll storylines, please. Both the email for the W Club as well as the forum chat with Vaughn revealed that, while brand new characters/sculpts will be introduced later as the series progresses, for this first release and as a form of re-introduction (since many have been absent for a while), the focus has been kept on key characters that collectors know already from FR: Homme and other Integrity Toys collections. Asked about the most popular male characters from the original line, Pierre, Francisco and Darius, Vaughn said that the last one will make an appearance sooner than expected, the second is coming too but did not specifically replied about the first. There are four dealer doll’s and two lottery ones. If you hurry, there might be some left still at Integrity Toys dealers. Remember they all have the new body, Homme 2.0, first shown on the convention Monarch, Declan. My overall impression: underwhelmed. After six years of waiting the return of the Hommes, I was bummed to see faces from other lines taking their place. The clothing is not coherent. While some outfits are daring and all look well made and tailored, they were not what I was expecting from a line being worked upon for so long. I will expand on this on each particular doll below. The raised price point is a cause of conabput many collectors. $175 for a doll is a lot, accesyand quality notwithstanding. Why are all these $45 more than Bellamy Blue from the Industry line, whose outfit and acc are equally well made, rich and detailed? Vaughn said the price point can change according to the outfit and accessories. I did not order any doll now and will wait to see when and how Darius and the rest of the old gang will appear. UPDATE: Most dealers have all dolls available yet, so it seems the pricing is keeping people from buying. UPDATE II: caved in and preordered Tenzin. Vu Nguyen posted some visuals from Jojo’s Bizarre Adventure and when I saw them it clicked. It’s a Japanese manga and anime series. Retail Price: $175.00 + S & H - WILL BE OFFERED VIA RIGHT-TO-BUY LOTTERY, DETAILS TO COME CLOSER TO THE FIGURE'S ARRIVAL DATE. This is my favourite of the reveal. I always liked the Ace McFly sculpt but do not have one. And although a $175 doll that does not feature a belt is a major faux pas in my book, I will probably enter the lottery for this one. The straps on the waist and sleeves of the jacket are functional (Velcro) and adjust how tight it fits. Hope the hair in the final production doll stays the same. I know they have Monarchs written on their side, but still, wouldn’t you rather have the ones above? Yes, me too. The bag has a magnetic closure on top of its zipper. I like Tobias, I have the one from the MLP line, which is probably why this one does not make me want it. The outfit and accessories do not scream “buy me” at all, especially for a $175 doll. Plus I hate fanny bags. Really. They should be condemned for eternity in the flames of fashion inferno. Declan is always a favourite with collectors. This one is a bit bland as a doll, but with an interesting outfit, that plays with contrasting textures and has a modern feel. The iPad case could have been made in a bolder colour to offset his neutral clothing. I dislike thick soled loafers in real life and it surely transfers into dolly land. For a business man, I’d expect Elias to have at least a briefcase or at least a laptop case with a computer miniature inside, to justify his price tag. Unfortunately all he has to show is another checkered suit (we’ve seen it before) and a fur coat (Industry vibes here). His sculpt is the original Dracula one, as Vaughn mentioned in the forum, the final Perry sculpt was supposedly softer. Did not like it before, do not like it now. I’d rather see Pierre or Francisco in his place. IMPORTANT NOTE: This Romain is a hair color variation of the one offered to convention guests who attended the Monarch launch event last October at the Luxe Life convention, in lieu of the promised doll/centerpiece. This blonde version will be made available for W Club members only later this Spring/Summer. Should quantities remain of the convention version, Integrity Toys will announce at a later date how they will be offered. Do not contact Integrity Toys at this time to inquire, as they do not have any additional information available. This is my least favourite sculpt of male Integrity Toys dolls. No matter the version, I find his face off putting. I like the sweater and pants though. The boots could have been a bit more detailed at this price point. The camera with accessories and bag is a nice touch. This is a lottery doll as well. I suspect the edition size will be determined by the size of the other version. So what do you think of this new collection of Hommes? Did you order any? Let me know in the comments. The figures shown and the accessories in the product pictures are prototypes. As always, final fabrics, colors, shapes and textures may vary slightly. For adult collectors ages 15 and up only. All photos and information contained herein is copyrighted Integrity Toys, Inc. and Intercap Merchant Partners, LLC 2019 and may not be reprinted or disseminated without express written permission. THE MONARCHS and all other character marks followed by ™ or ® are trademarks of Integrity Toys, Inc. Chesapeake City MD USA 21915. All rights reserved. The W Club is a trademark of Intercap Merchant Partners, LLC. All rights reserved. 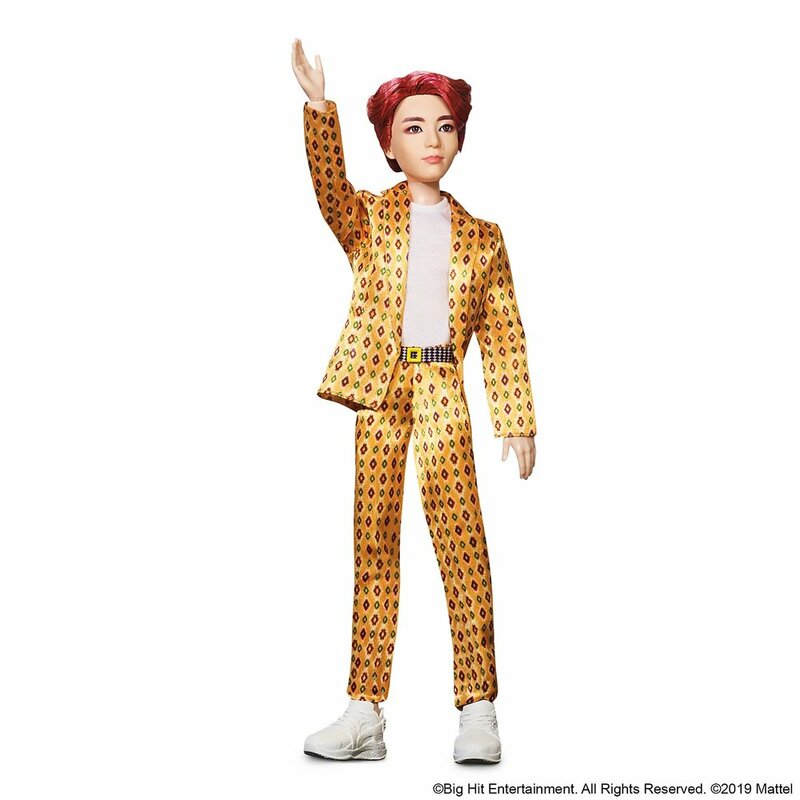 Mattel finally reveals the BTS dolls! 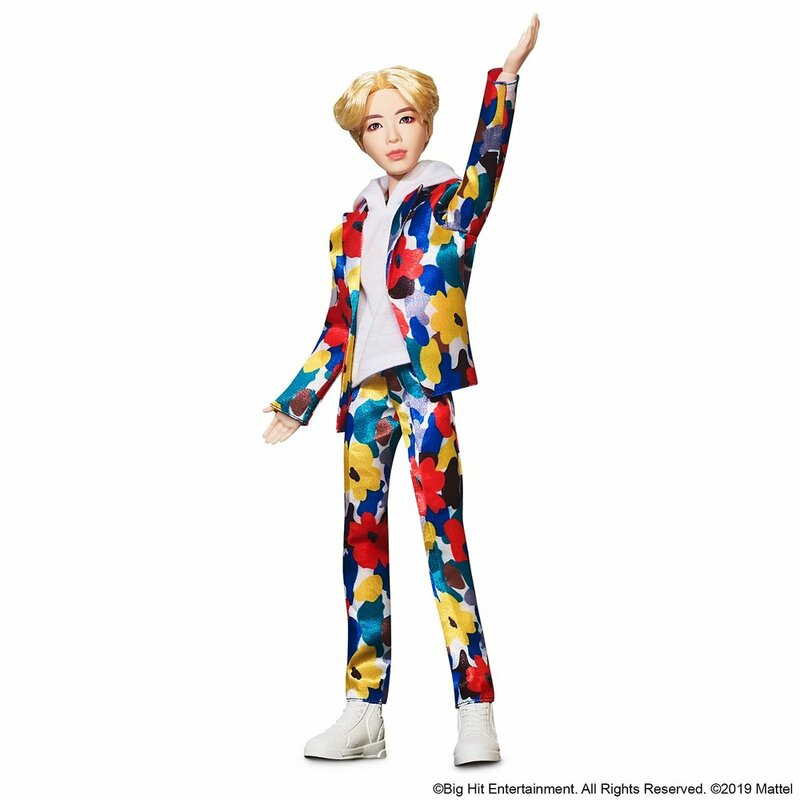 At the beginning of the year, Mattel announced that they would be releasing dolls made in the likeness of the KPop (Korean pop for those of you that do not know that kind of music) boy band BTS - seven guys who are very popular outside of Korea too, having topped Billboard 200 chart twice in 2018. They are touring the world this summer and the dolls are supposedly hitting the shelves either this summer or in September. They will be available worldwide and each doll will cost $19.99. They look cute and definitely articulated, but the body/head proportions are off, like they are kids. 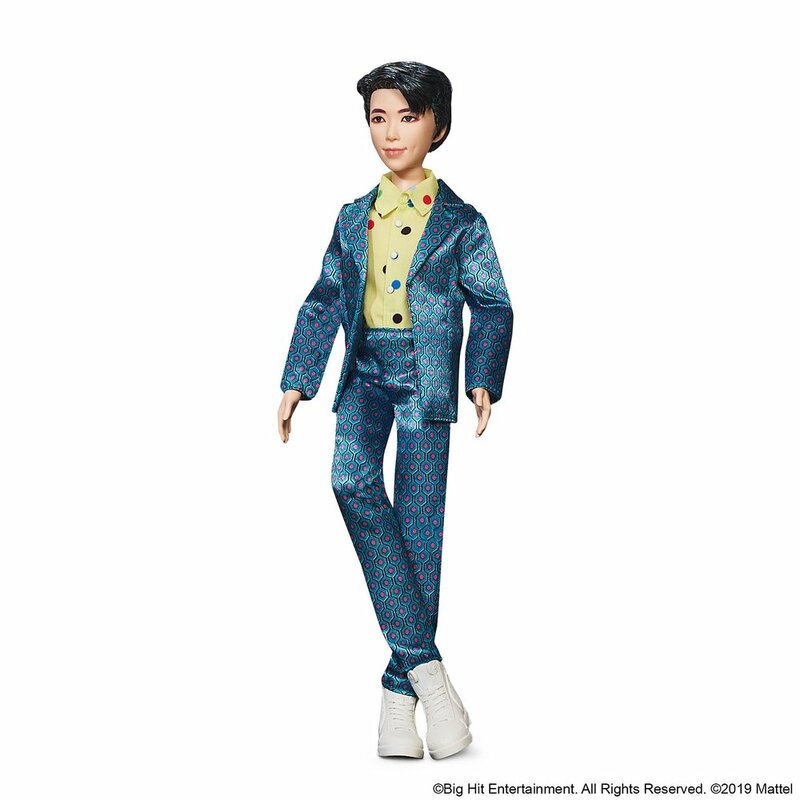 They could be sporting the My Scene male body, which, if I remember correctly, is the same as Ken’s articulated one but with longer hands - and of course bigger head. The Mattel shop website, where the dolls are already uploaded, indicates they are 11” and have 11 points of articulation. The sculpts are original, one for each band member. The clothes they are wearing are from the video clip of their song IDOL, which premiered last August. You can sign up at the Mattel shop to get notifications about the upcoming release. I might try to get one, just to check out the outfit - I love the colourful costumes, unlike anything worn by male fashion dolls. Most of the clothes in real life are from well known fashion brands. For example the polka-dot shirt RM is wearing is by Comme Des Garçons, just like Jin’s sneakers (a Converse collaborartion). 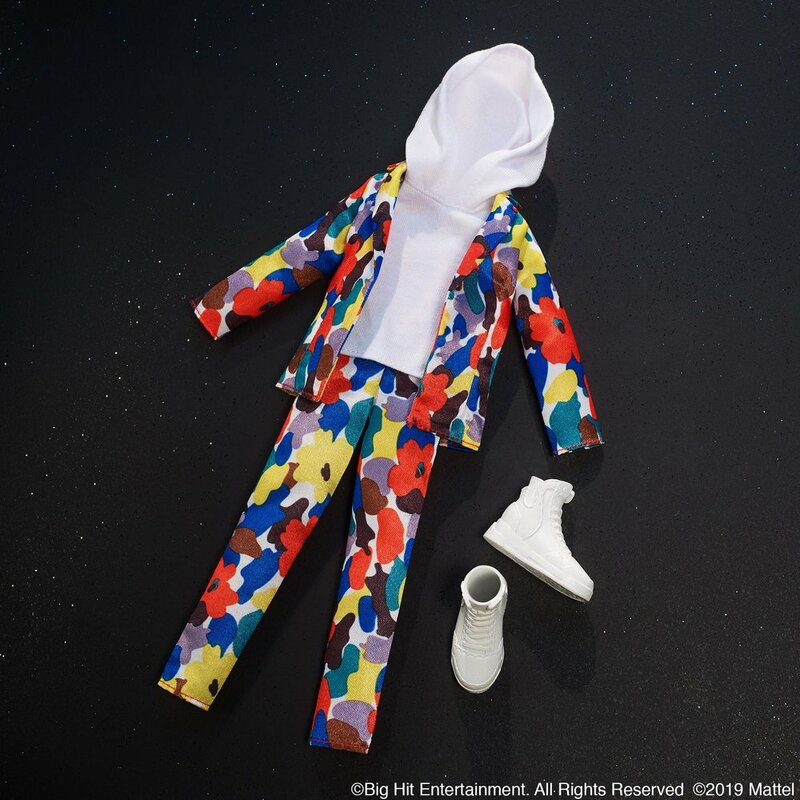 J-hope and Jung Kook’s sneakers are Valentino Hero Tribes, while V was wearing Walter Van Beirendonck shoes, which unfortunately were not made for the doll. Pidgin Doll Spring 2019 collection is unveiled! The Pidgin dolls are created by the extremely talented and wonderful Joshua David McKenney, an artist, sculptor, doll-maker extraordinaire and fashion illustrator. He just released the Spring 2019 collection of Pidgin Doll and here they are in all their glory. (Availability according to the Pidgin website at time of posting). The dolls are 16, all one of a kind and are ball-jointed 1:4 scale, made in resin. You can find their exact measurements in their website. That’s where you can buy them as well. The ones left available of course! Double “stacked” red synthetic mohair wig. Robert Tonner communicated a letter that describes his decision to shut down his latest company, Phyn And Aero at the end of this month, citing production problems like rising costs and increasingly long lead times. Here it is in its entirety. As I stated back in January, the only thing you can count on is change, and I'm afraid I must change course yet again. As much as I've always loved manufacturing, on-going production issues have continued to wear me down, and as a result, Phyn & Aero will cease operating as of March 31st. Please know, when I refer to production issues, I'm referring to continuing rising costs and ever-growing lead times. I've always been proud of the fine work done by the factories—they care about the product every bit as much as I have—and the wonderful people we work with are as disappointed as I. Please know that this was not an easy decision for me or for us, nor a decision made lightly. This decision, however, does create an opportunity for you to secure the last of any Phyn & Aero product. This includes Lila, Annora, Kadira and Nancy Ann—some of which have just arrived. Look for discounts on the product, but please note there will be no returns nor refunds. Also, should you order a Kadira item look for a little "freebee" in your box! Please note, the Phyn & Aero website will be accessible through April but mainly to print off any images or descriptions you may want to retain. As strange as this may seem under the circumstances, I am introducing a new doll—Rayne. I've attached our sell sheet from Toy Fair to explain what she is all about. The Shapeways store will be open, with at least a couple of pieces to order, by the end of the month (please refer to the sell sheet—this will make more sense). The dolls will be available thru a select group of retailers that are listed on our website, (be sure and click the link at the bottom of our site). My new portfolio web-site, showcasing my current and past doll/figure designs and sculpting, will be up in a few days. Please check it out. (www.roberttonnerdesign.com). Some great news—just because I'm closing P&A that doesn't mean that Kadira will be going away. Andrew Yang will be continuing to promote and develop Kadira and would be thrilled to hear from you. He can be reached at aycollective@gmail.com. So, you may ask, what the heck am I going to do now that I'll be out of the doll business? Well, I may be out of manufacturing, but I'm certainly not leaving the doll world. I'm working with various companies on freelance projects—and I've even signed a deal to do human (not doll) handbags and jewelry. So, I'll be around. Be sure to check out my new web-site and friend me on Instagram. I can't tell you all what a wonderful ride this has been. The events, the parties, Toy Fair, the Magazines, and mostly you—the collectors—have made this entire doll world experience more than I could have imagined it to be. I sincerely thank you all from the bottom of my heart for the fun, friendship and the mutual love of this hobby—doll collecting. Rayne is your creative muse, your personal fashion model, your fashion canvas. She’s the realistic 16” fashion figure of your dreams. She’s a beautiful doll but what makes her so special? Sculpted by renowned and award-winning doll designer Robert Tonner, Rayne is a 16” realistic fashion figure with 15 points of articulation. She’s made of the finest hard plastic and vinyl with rooted saran hair (or unrooted for wigs). So, she’s a normal fashion doll. Not so fast. It’s not what we, the manufacturers have created but what you will do with Rayne that will really set her apart. I’ll explain: Rayne arrives in a basic set of sport underwear and shoes just like a normal basic doll. However, that’s where the similarities with other commercial fashion dolls ends. How you dress and style her is up to you. Again, like any other fashion doll so what makes her so different? You’ll be able to go to the Shapeways website at www.shapeways.com and shop in the R. Tonner Design store where you’ll find many accessories such as shoes, breastplates, cuffs, hats, sculpted wigs, jewelry, historical foundations and much more—all designed and sculpted just for Rayne. New styles will be added all the time. Pick the accessory you’d like for Rayne and order it in the material that suits Rayne’s style. How about a pair of purple pumps? Or a transparent, form fitting breastplate? Jewelry in real gold? Sure, why not? You can even order a plastic accessory that you can paint, decorate or even bedazzle! It’s easy and fun to do. You just go on the Shapeways site, pick the style you like, pick a material and color and order. It’s just that easy and your accessory is made exclusively for you and shipped directly to your home. I’m glad you asked! Patterns for easy to make outfits for Rayne will be available in March/April on the R. Tonner Design (RobertTonnerdesign.com) site to download. Become a part of 3D printing technology revolution and enjoy an enhanced doll collecting experience--welcome to the creative world of Rayne! I had no interest in any of the Phyn And Aero products, but the Tonner Outlander and Wonder Woman dolls are some of the best he released and would have loved to see more of them. Unfortunately it does not seem to be possible anymore. Hand me the Envelope please - the latest Sybarite is sold out! This Valentine’s Superdoll London doll is the beautiful Envelope, a brilliant take on a geisha, in her white kimono, towering hair and intricate details. She’s already sold out I’m afraid, but you can enjoy her in the photos from Superdoll below, as well as the site description. Anyone here for the opening of Envelope? VENUS strolled through a sea of paper cranes singing to herself: "its a nice day for a white wedding....". Her gorgeous oriental styled hair is just a hairs breadth short of a statuesque ikebana. Platinum, but in hair terms its almost white, white. Above the shoulders blunt bob, pulled up into a top bun and side bunches; with long paper like sideburns and a blunt slightly curved fringe.. Her gold and teal eyes are rimmed in salmon, rose and soot and her lips of pomelo glossed and glossed again. Other than her utter delight at the origami cranes, she is delighted by her dragon and peonies brocade 2 part kimono. A whole lot contemporary and a whole lot traditional... just a vision of genius from her favourite designers. Tucked into her obi, are velvelette laser cut starfish held in place by her gold and purple obi. Her choice of jewellery is a 'silver' bug adorning her obi and finished with a white corded obijime. Ceremoniously she wears a red silk tasselled waist sash. upon her feet she wears Sock style 2 tooth Geta. She looked up and smiled at the jucstaposing cranes which reminded her or her organza backpack which indeed is her kimono overcoat.